US – Who killed JFK? 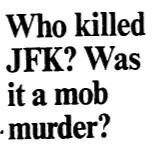 Was it a mob murder? Title: US – Who killed JFK? Was it a mob murder? When President Kennedy’s motorcade drove into Dallas’ Dealey Plaza Nov,. 22,1963, there were a least six assassins awaiting him. All were part of a plot to kill the president orchestrated by Sam Giancana, the Mafia don from Chicago, and elements of the CIA. The plan had everything. It even had a patsy, Lee Harvey Oswald, with his cheap carbine, was to be the scapegoat, “the lone assassin.” His path away from the Dallas School Book Despository had already been laid out. On the run, he was nabbed by Dallas officer J.D. Tippet (“owned” by the mob) and Roscoe White. Oswald was locked up. The next morning, as he was being transferred to another facility, he was murdered by Jack Ruby, a nightclub owner who had been very friendly with the cops. Few people will ever forget that scene. But Jack Ruby was not just a sleazy club owner. He was Sam Giancana’s man in Dallas and had been since 1947. This is hearsay, of course – no court would admit it – but considering where it comes from, it’s heavyweight hearsay. It comes from a new book called Double Cross (Warner Books, $22.95), written by Chuck Giancana, brother of the Mafia don, and Chuck’s son, Sam Giancana, who was named after his uncle. The younger Giancana was here recently to talk about the book. Their book offers insighrs into the presidential assassination, the Mafia’s toehold in Hollywood and the death of Marilyn Monroe, among other mysteries. Chuck Giancana was not exactly a member of the Chicago Mafia – the Outfit as the Mafiosi called it – but he handled small jobs for his brother (a graduate of the Al Capone school of gangterism). The elder Giancana often spoke freely to him about how things had happened. Giancana, the Mafia don, was nicknamed Mooney. Once, when he was leaving for Mexico, he was chatting with his brother Chuck. “We took care of that,” he said meaning the president. Mooney said he had brought in two or three assassins – Chuck Giancana had gone to school with one of them. Mafia chiefs Santos Trafficanti and Carlos Marcello had furnished some men, and the CIA had supplied still more. Chuck Giancana learned a lot by listening, his son indicated. Members of the Outfit would talk to him, confident that the don’s brother knew how to be quiet. The Mafia believed that it had been double-crossed by the priapic Kennedy. It had supplied him with campaign funds and women from Hollywood, it had even arranged an affair with Marilyn Monroe. Sam Giancana believed he was buying a president. “When they want something from the president, they’ll have to go through me,” he boasted. As attorney general, Robert Kennedy started a vigorous campaign against the mob. To Giancana, the Outfit had had relations with the government for some time, said Giancana. It had been involved in schemes to assassinate Fidel Castro by poisoning. “The CIA and the mob,” said the younger Giancana, “had worked together throughout the 1950s in various locales around the world. Our own government admitted after the assassination attempts against Castro the relationship existed. What we’re seeing is that the relationship began much earlier, that it was not a one-time event and it continued to the point of assassinating the president of the United States. We’re saying that the mob had a kind of minor, a junior member of this plot that had been developed by the CIA, just like the mob had participated in various locales around the world. “We talk about Guatemala, Iran, the Philippines and Indonesia. To do some of their dirty work, the CIA often used mob individuals on the front line. “That’s exactly what Mooney had communicated this time, that he had used several of his assassins along with the CIA plot against the president. Chuck Giancana had grown up with on of Mooney’s hit men. It was to protect this relationship that Marilyn Monroe was murdered. Monroe talked too much, Giancana said. “She talked not only about her relationships with both Kennedy’s, but the CIA and the mob. There was a lot of damaging information. She really put herself in jeopardy by saying what she did. She was threatening to talk too much. She certainly didn’t die by suicide. “My information is so good I have not doubt what happened. She’s a woman who’d already done drug overdoses, so it seems to be a natural, just look at the situation. “Another Outfit man told my father the hotel (where Kenned was shot) was under control of the Outfit. They had been able to change security people at the last second. Sirhan (Sirhan, who is in prison for supposedly killing Robert Kennedy) had been in debt to the mob. “I don’t know the details,” Giancana said, but going back to the 3-‘s there’s this lone-gunman theory. Chuck Giancana and his family changed their name in 1969. Giancana’s said the book’s dialogue is reconstructed. He and his father wanted to show that it isn’t pretty inside the mob. It’s a brutal, ugly world. Sam Giancana, the Mafia don, was to go much as he had lived. After a trip to the Medical Center here, he went back to Chicago. One night, as he was frying sausages in a pan, somebody walked in and skillfully filled his head with .22 bullets.